k3s (“kates”), a minimalist version of Kubernetes (“k8s”). Marshall Brekka “Home Kubernetes Cluster” build. 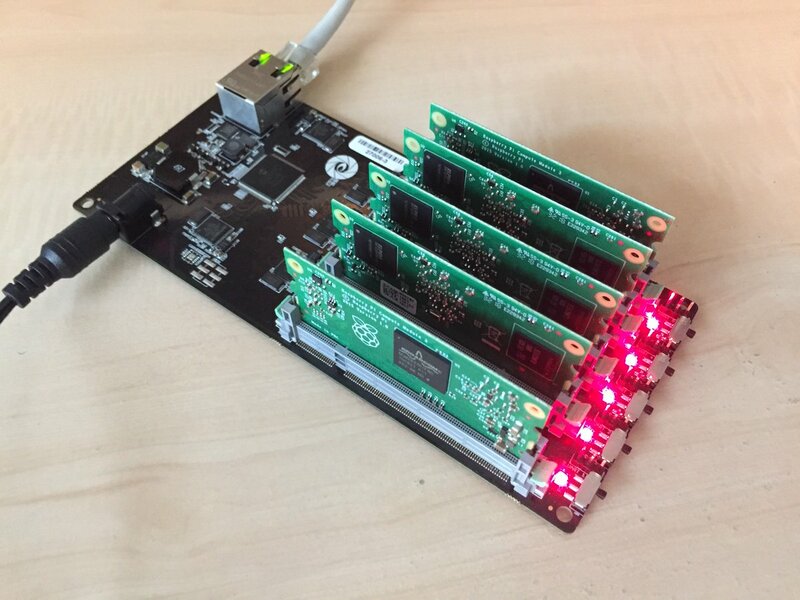 David Tischler of MiniNodes has produced a second spin of his 5-node Pi 3 Compute Module carrier board. The latest edition adds LEDs and serial ports to each module for improved debugging and visual monitoring. The carrier board incorporates an Ethernet switch and a single power jack to power all the modules. MiniNodes produced this project with the help of Gumstix and from Arm. k3s (“5 less than k8s”) is a lightweight and minimalist version of Kubernetes. It consumes half the memory of regular Kubernetes and fits into applications for edge, IoT, CI, and “situations where a PhD in k8s clusterology is infeasible”. A lot of things have been removed, and hopefully you won’t notice. k3s is a project from Darren Shepherd of Rancher, and some things you’d really want to have work in a production environment are not complete yet. Alex Ellis of VMware and the OpenFaaS project reports that he’s able to run OpenFaaS on k3s, and that the bootstrap process involves only downloading a single binary on an untouched Ubuntu VM. Marshall Brekka has a nice home Kubernetes cluster build, featuring a control plane running on a Banana Pi M1, with its dual-core 1 Ghz CPU. Several default settings had to be adjusted for the Banana Pi as the TLS encryption routines on that device are sufficiently slow that they cause timeouts. A faster quad-core A53 ROC-RK3328-CC board in the same cluster does not require adjustments since it’s fast enough to get the crypto done in time. Via Chris Short who runs the DevOpsIsh newsletter. Brian Ingenito is running OpenFaaS on his Pi cluster, which incorporates a Synology NAS for iSCSI and NFS-mounted Docker volumes. His design incorporates BerryBoot, a boot loader and univeral operating system installer for the Pi which allows you to boot from networked storage. Olimex has released a new image for their Allwinner A20 based single-board computers, including the A20-OLinuXuno-LIME, A20-OLinuxUno-MICRO, and A20-SOM and A20-SOM204 systems. The image is based on Armbian with OLinuXuno specific features, and the software recognizes the feature of the numerous variants of A20-based systems they have released and auto-detects a configuration. The A20 (sun7i) is a dual-core Cortex-A7 system-on-chip design, integrating a Mali400 GPU. Lenovo showed its ACPC at CES. The Lenovo Yoga C630-13Q50 laptop features a Qualcomm Snapdragon 850 SoC, a cellular modem which switches seamlessly with WiFi to keep you connected (hence the name “Always Connected PC”), and “outstanding” battery life per a report from Kevin Krewell at TIRIAS Research. Windows Central also raves about the battery life of this devices, measuring 15+ real-world hours of use in a device with 8GB of RAM. The Snapdragon 850 was announced in June 2018 and has a big.LITTLE design with 2 Kryo 385 Gold (A75) cores and 4 Kryo 385 Silver (A55) cores, according to specifications collected by WikiChip. Jon Masters of Red Hat is interviewed at last year’s Linaro Connect in Vancouver, BC about Meltdown, Spectre, Arm servers, high performance computing, and systems from Ampere. Where I get this stuff. Packet Community Slack #worksonarm and #community channels.